Interview with Matt for JazzBluesNewsSpace.com. "Two for the Road" was featured on Jack Frieden's show on WHRO (Norfolk, VA) titled "The Vocal Sound of Jazz" on Nov. 18. The cut that was featured was "Summer in Central Park." What is significant is that the playlist for this one-hour show (about 12 tunes) includes major vocal artists like Ben Sidran and Gregory Porter! Listen to the archived episode here. Will Bowman of La Grande Alive interviewed Matt about the Grande Ronde Symphony concert that took place on Nov. 15th, featuring the Mozart Piano Concerto in C Major, K. 467. Matt just released a new CD with his wife, Sharon Porter, on vocals! The album includes fifteen jazz standards (Ellington, Jobim, Harold Arlen) or "new standards" (James Taylor, Bobbie Gentry, Hank Williams, Procol Harum). Matt and Sharon are backed by Spokane bassist Scott Steed (Horace Silver, the Monterey Jazz Festival band, Diane Schuur) and drummer Michael Waldrop (Michael Waldrop/Jack Cooper Big Band). Daily Times article, "Pianist Matt Cooper Featured at SJC Jazz Fest"
Celebration of Billy Strayhorn/Duke Ellington Study Group conference at Reed College. Matt shared the stage in Kaul Auditorium with David Shifrin, Darrell Grant, and Rebecca Kilgore. The hall was sold out with over 750 people in attendance. Three Ellington and Strayhorn compositions from the opening concert. 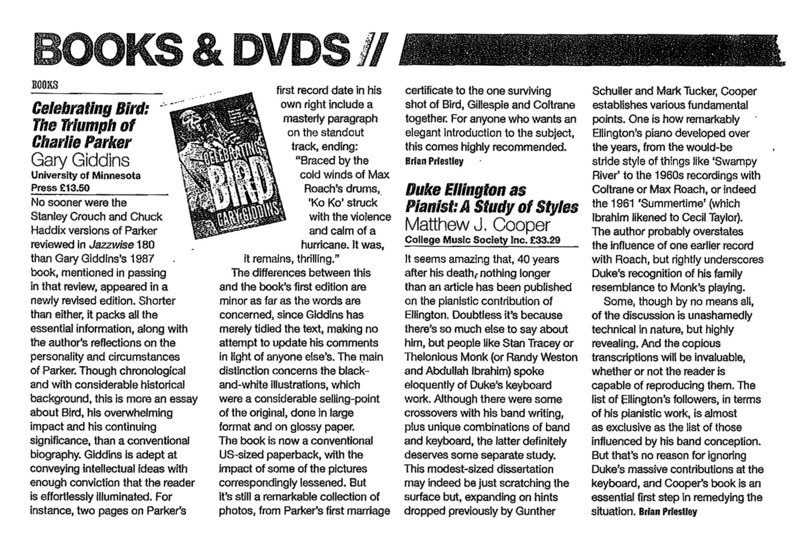 ​Matt's monograph has been hailed as a "significant and permanent contribution to Ellington's music and legacy" (Geoff Smith, Blue Light) and has been reviewed by Brian Priestley in the June 2014 Jazzwise.